Administration of 5-hydroxytryptamine (5-HT)1A and 5-HT2A receptor agonists into the dorsal periaqueductal gray (DPAG) inhibits escape, a defensive behavior associated with panic attacks. Long-term treatment with the antipanic compound imipramine enhances the DPAG 5-HT1A- and 5-HT2A-receptor-mediated inhibition of escape, implicating these receptors in the mode of action of panicolytic drugs. 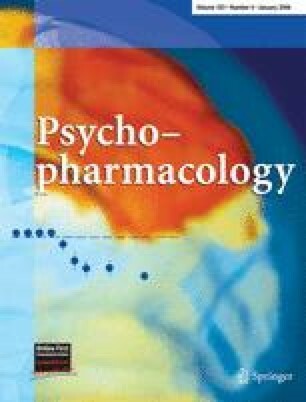 In the present study, we investigated whether the inhibitory effect on escape elicited by the intra-DPAG injection of 5-HT1A and 5-HT2A receptor agonists is also enhanced after treatment with fluoxetine, another widely used antipanic drug. The effects of fluoxetine were compared to those of buspirone, an anxiolytic drug without major effect on panic disorder. Male Wistar rats, subchronically (3–6 days) or chronically (21–24 days) treated with fluoxetine (10 mg/kg i.p.) or chronically treated with buspirone (0.3 mg/kg i.p. ), were intra-DPAG injected with 5-HT (20 nmol), the 5-HT1A receptor agonist (±)-8-hydroxy-2-(di-n-propylamino)tetralin hydrobromide (8-OH-DPAT; 8 nmol) or the preferential 5-HT2A receptor agonist (±)-1-(2,5-dimethoxy-4-iodophenyl) piperazine dihydrochloride (DOI; 16 nmol). The intensity of electrical current that applied to the DPAG-evoked escape behavior was measured before and after the microinjection of these agonists. The electrical current necessary to produce escape was increased after the microinjection of the three 5-HT receptor agonists in all groups of animals tested. However, this panicolytic-like effect was significantly higher in animals receiving long-term treatment with fluoxetine. The results suggest that facilitation of the 5-HT1A- and 5-HT2A-receptor-mediated inhibition of DPAG neuronal activity is implicated in the beneficial effect of antidepressants in panic disorder. The authors thank Afonso Paulo Padovan for helpful technical support and Eli Lilly (Brazil) for kindly donating fluoxetine. Financial support was from FAPESP and CNPq, Brazil.